National and local reports about adolescent marijuana use are not trending in a good direction — and both suggest youth living in states where marijuana is legalized face higher risks associated with the drug’s use. First, the local report: Arrests related to marijuana during the 2013-14 school year were up on Denver Public Schools campuses 6 percent from the previous year, according to data released by the Denver Police Department. The state’s largest school system — which shares its home with the state’s largest concentration of marijuana sales outlets — reported 289 marijuana-related arrests during the 2013-14 school year, compared to 273 the previous academic year. The 2013-14 school year includes the first seven months after the Jan. 1 opening of recreational cannabis stores in Colorado. While most of the arrests happened at high schools, marijuana-related arrests at middle schools also garnered dozens of arrests, including 64 in the 2013-14 school year. There were eight arrests at elementary schools in that period. Students who talked to 9NEWS at North High School said they believe the spike in campus arrests has more to do with an increase in the drug’s use rather than more rigorous enforcement by schools. “It’s Colorado,” adds Jesse Gonzalez, saying that students simply have easier access to the drug than they did before. “Denver Public Schools is very concerned about the apparent increase in marijuana use by students.” The statement noted that the system strives to provide substance education, intervention and counseling services to students. “Those efforts were recently expanded at the middle school level through the hiring of a substance abuse prevention supervisor,” DPS stated. Separately, the nation’s largest and longest-running survey of American youths’ attitudes about drugs — called Monitoring the Future and conducted by the University of Michigan — has found in its 2014 report that marijuana use among the country’s middle school and high school students is holding steady with 6.5 percent of 8th graders reporting past-month use, 17 percent of 10th graders and 21 percent of 12th graders. About 6 percent of 12th graders reported daily use. More troublesome is that the rate at which students perceive harm from marijuana use continues to fall. Among high school seniors, 16.4 percent said occasional marijuana use puts the user at great risk, down from 19.5 percent last year and 27.4 percent five years ago. For decades the metric has predicted future drug use rates — meaning that when fewer youth consider a drug harmful, more youth are likely to use it. However, this year, there are different takes about what the latest drop in perceived harm means. Former Senior White House Drug Policy Advisor Kevin Sabet, co-founder of anti-legalization group Smart Approaches to Marijuana (Dr. Christian Thurstone serves on Project SAM’s science advisory board), said one year of data are not enough to declare a change in association. 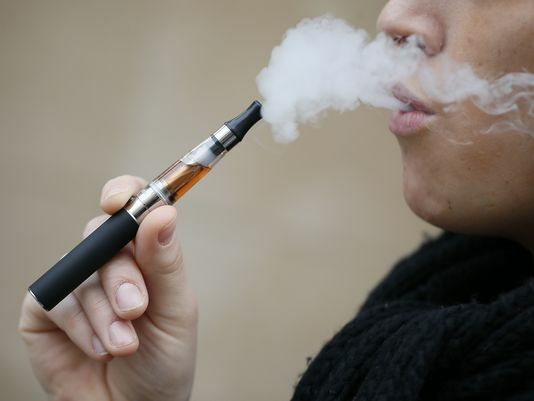 • E-cigarette devices have made strong gains in popularity among adolescents. For the first time in the survey’s history, students were asked whether they had used an e-cigarette in the past month. Nine percent of 8th graders reported using an e-cigarette, compared to 4 percent who reported smoking a tobacco cigarette. Among high school seniors, 16 percent said they used an e-cigarette, compared to 7 percent of seniors who used tobacco. • Fewer teens are trying synthetic marijuana, often called K2 and Spice. About 6 percent of seniors said they had used the highly dangerous drug in the past year, down from 8 percent last year and 11 percent in 2012. • Abuse of prescription painkillers is dropping. Six percent of high school seniors reported using such narcotics without medical supervision in the past year, down from 9.5 percent in 2004. • Nearly 1 in 5 12th graders reported binge drinking, down from 1 in four high school seniors in 2009. Binge drinking is defined as five or more drinks in a row in the previous two weeks.